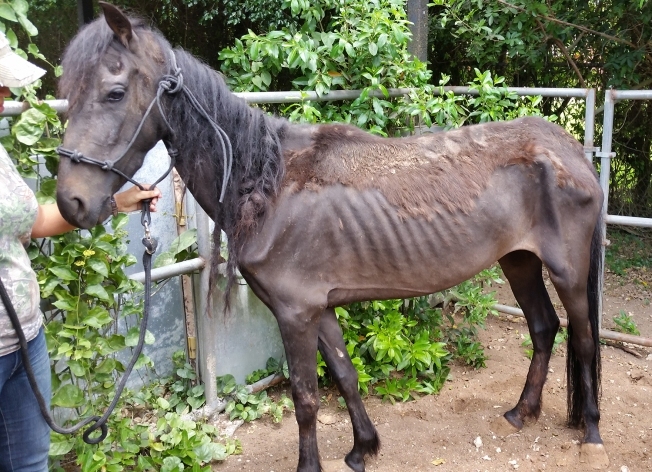 One of the horses seized from the Paez Ranch in May appears emaciated. Two married bodybuilders have been charged with animal abuse after emaciated horses were found on their ranch in southern Miami-Dade, Florida, according to the South Florida Society for the Prevention of Cruelty to Animals. Milagros Cowan, 50, was arraigned Friday on four counts of animal abuse. Her husband, Alex Paez, 48, was previously charged with animal cruelty and released on a promise to appear in court. According to the SFSPCA, this is Paez's second offense. He was charged with animal cruelty four years ago but was granted a pretrial diversion, so the case did not go to court. The investigation began after the Miami-Dade Agricultural Patrol seized three horses from Paez's ranch in May, according to the SFSPCA. Two horses were in "horribly emaciated condition," one with hooves so long she could barely walk, the SFSPCA said in a news release after the animals were confiscated. "There was trash and dangerous debris everywhere, all over the ground, making it almost impossible to find a place to walk without stepping on something. Flammable items were at the facility, along with old boats and trailers, outboard engines, buckets of paint, fiberglass material, cutting objects, garbage... There was absolutely no place to turn out the horses," SFSPCA volunteer John Garcia said in the news release. Paez told officials the horses were "a little thin and just needed to be dewormed," and their hooves were "not that bad," according to the SFSPCA. Paez's attorney, Alexander Michaels, said Friday the charges are "no big deal," the Miami Herald reports. "I wish the police would spend more time on human victims, and child victims, than on horses who skipped a meal," Michaels told the Herald.